Surveys show that the average organization requires up to 31 hours of unproductive meetings every month. Thinking about that in terms of lost revenue is more than a little frightening. So how can companies reduce these numbers? The solution is to make better use of available tools and to help employees create smarter and more productive office meetings. With just 9 small adjustments, organizations can make meetings thoughtful, informative and effective. While this might seem obvious, before scheduling a meeting, think about if it is really necessary. Much of the information and data sharing that required meetings in the past can now be easily shared through phones, emails, or internal collaboration tools like MangoApps. Collaboration tools make it easy for employees to brainstorm and work together on ideas, even from remote locations. Meetings take time and resources away from everyone and should be saved for when there is a real need. Most meetings should have no more than 10 members. Trying to include more than 10 people makes planning more difficult in almost every aspect. Holding a meeting with a large number of people or teams also makes them last longer and be less effective. The more people present, the less time can be spent on each area of concern and trying to address every issue can take serious time. Companies create more productive office meetings when small groups can work together based on their unique objectives and needs. Without a clear agenda, any meeting is headed for trouble. Even for brainstorming and other less structured events, having an outline of the task at hand helps leaders take control of their meetings by creating clear priorities and ensuring that important items are not lost or forgotten. Studies have shown that an average of 17 minutes can be saved when an agenda is distributed to meeting members beforehand. Agendas also allow leaders to share relevant documents ahead of time, letting participants review important content in advance. Helping members stay on task is just as important as creating an agenda. While avoiding tangents may feel difficult, staying focused will significantly shorten meetings and will allow important information to be taken care before everyone gets tired. During longer meetings when breaks are needed, make sure that they do not take too much time or become excessive distractions. Information presented at meetings should also be discussion based and focused on outcomes and consequences. Lists of data or background information can be shared separately through collaboration tools. Meetings should be planned with a designated start and end time. Unless there is a serious need, meetings should always start and end on time. Keeping meetings on a schedule is respectful to everyone involved and makes organization easier. When team members know that a meeting will end on time they can plan the rest of their day more effectively. Shorter meetings are usually more productive and when employees know that a meeting will end on time there is less temptation to get off task. Every employee in the meeting needs to be ready to share and participate. This means that ideas and reports need to be well structured, thought out and ready ahead of time. Enterprise tools like MangoApps are incredibly helpful for pre-meeting preparation by providing powerful project and idea management tools that seamlessly organize information. Even spending just a few minutes ahead of time to get ready and prepare makes a huge difference in creating productive office meetings. Valuable meeting time is often wasted looking for an area with enough space to accommodate everyone or a room with the technological hookups you need. Scheduling a space in advance ensures that meetings can start on time and that they already have all of the necessary resources. Scheduling a room also means that meetings have been planned in advance, helping everyone to come better prepared and encouraging meetings to end on time. When meetings are lengthy or when certain topics are discussed for long periods of time it can be easy for members to get distracted or bored. Temporarily shifting topics or taking a short break can help everyone stay engage and focused on what is ahead. These breaks or short discussions should only be used to help members re-engage and get back on track, and should not become distractions or lengthy conversations. Keeping everyone focused and attentive is one of the best ways to create productive office meetings. Project meetings can be an ongoing saga and they often need an element of continuity. Briefly reflecting and reviewing the minutes of the previous meeting can help refresh member’s memories and give more context to the discussion. This is where keeping track of the meeting minutes becomes a priority. Modern workplace software like MangoApps provide all kinds of options to keep track of important minutes and information and make it easy to share them with others who were unable to attend. Meetings are an irreplaceable part of workplace culture but they don’t have to be boring, monotonous, long or a waste of time. 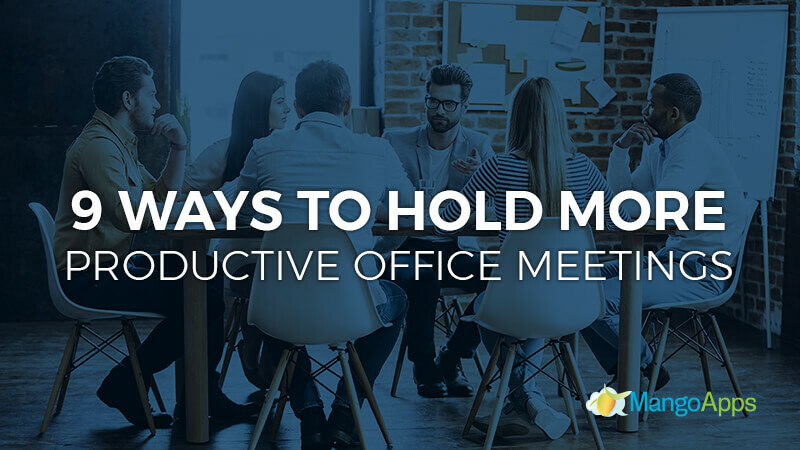 It only takes a little extra effort to hold more productive office meetings. MangoApps provides companies with the perfect platform to organize and collaborate from anywhere in the world, helping companies not only hold better meetings but also create a more productive and more creative and collaborative environment. Schedule a demo to learn more about us today.